Rabbit In The Headlights: Why carve my own when there’s Google? Yeah, that ought to take care of it. Just had a Costco pumpkin pie last week! :) Can't wait to get another one for Thanksgiving! We usually carve pumpkins, but Jim's the one that is more involved like that. I'm dying over the "screaming deal on corn". Seriously. I cannot get out of Costco without spending at least $300. Ewwwww! 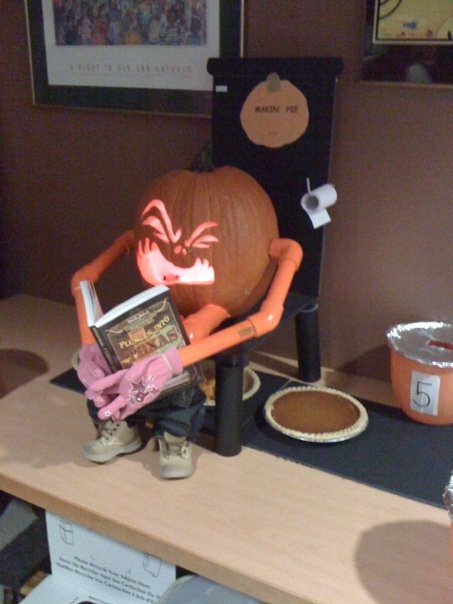 You've just ruin pumpkin pie for me. Love Costco pumpkin pies and I don't carve them either. I do, however, make homemade pumpkin pies. Just cut the pumpkin in quarters and bake it in the oven, than spoon the pumpkin out and freeze it. We love he homemade ones and they are pretty easy. I haven't tried canning it myself yet, just freezing it for thanksgiving and Christmas. Good luck. Hope you have fun whatever you do with the pumpkin!! When you said pumpkin pie, the first thing I thought of was COSTCO! because they are so yummy, and also, last week they were on sale for $5.99. Will you go buy a Costco pie and send it to me? That's a hilarious picture. Especially since my first attempt at from scratch pumpkin pie is in the oven as we speak. just went to the pumpkin patch last night in fact. It was 5 pumpkins for $20 dollars. Yep we do carve them all. Send Drew on over and play with the fun aunt! Funny pic! Just come over this year for Thanksgiving. I'll make the pie. The only pumpkin pie I like is my wife's. It may possibly be the only thing which she can cook perfectly. However, will give Costco's version a try based on these recommendations and bring you the rest if it's bad advice. You know, my mom doesn't do any of those things either, and I've had a store-bought birthday cake every year. And she also makes no apologies for it. And I kind of love that about her.